So, I had some of that vegan quiche I made last night for breakfast today. Verdict? It was alright; I had to heat it in the microwave because I got up a little late – it probably would have been better if I’d done it in the oven like I’d originally planned … But it was pretty good; it had a weird consistency (I’m still trying to get used to the texture of soy/soy products) and, as with all quiche, I had to add ketchup to get the full effect … I think if I make it again I’ll be less stingy with the onion, and maybe add two of them, and tomorrow I might top it with some of the vegan cheddar cheese I have … All in all, though it didn’t live up to Caz standards, it was still tasty; I’d make it again some time I think. Today was also the day that I started my new calorie counting diet and exercise, so I got up this morning, ate breakfast, and went out in the freezing slush-rain, and rode my bicycle. It was my plan to start out small; I was originally going to bike for half an hour in the mornings, but I saw several websites that said you should try to take it slowly when you first start exercising – break it up into two or three intervals at 10-15 minutes a piece for a while until you build up the endurance to ride for longer. I figured I could ride twice a day if I wanted to, but I really just assumed that I would have no problem riding 15 minutes, and anticipated just continuing on for another 15 to get it over with in the morning. I have never been so WRONG in all my life. I rode my bicycle for 11 minutes this morning and I thought my legs were going to fall off. Or somehow forcibly remove themselves from my body – I dunno. Either way I thought I was going to die or never walk again. So … there’s that. Looks like I’m going to have to take it slow – 10 minutes in the morning, 10 minutes in the afternoon, and escalate it from there. I also did 10 minutes of yoga after my near death experience, which helped me feel like my throat and lungs were no longer on fire. So that was a plus; I’ll try to continue doing that as well to sort of offset the 10 minute cardio work out … I had no idea I was this out of shape. The other thing I started today, as I mentioned, was my calorie counting diet – according to this website, in order for me to lose about 100lbs in a year (that’s roughly 2lbs/wk for 52weeks) I need to start this week eating 1257 calories/day. So far I’ve had about 950, after having a slice of quiche for breakfast, an apple as a snack this morning, and a pretty good sized salad for lunch. It’s about 5:30 now, and I’m still not hungry for my last 300ish calories, but I am sure I will be – I still have another 10 minute bike ride to go on. 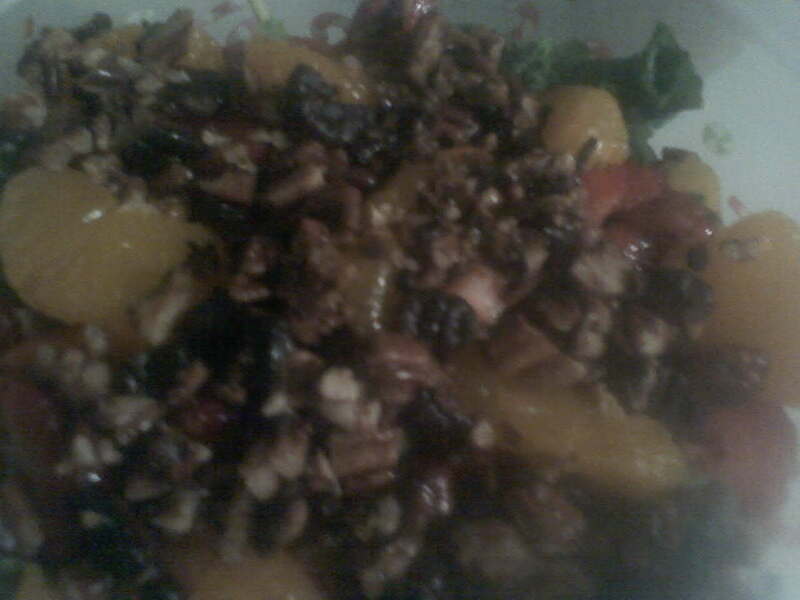 Here’s a close up of what the salad looked like; sorry for the picture quality – I had to take these in the evening (since I made this for my lunch the night before) and with my cell phone because for some reason I couldn’t find my camera. 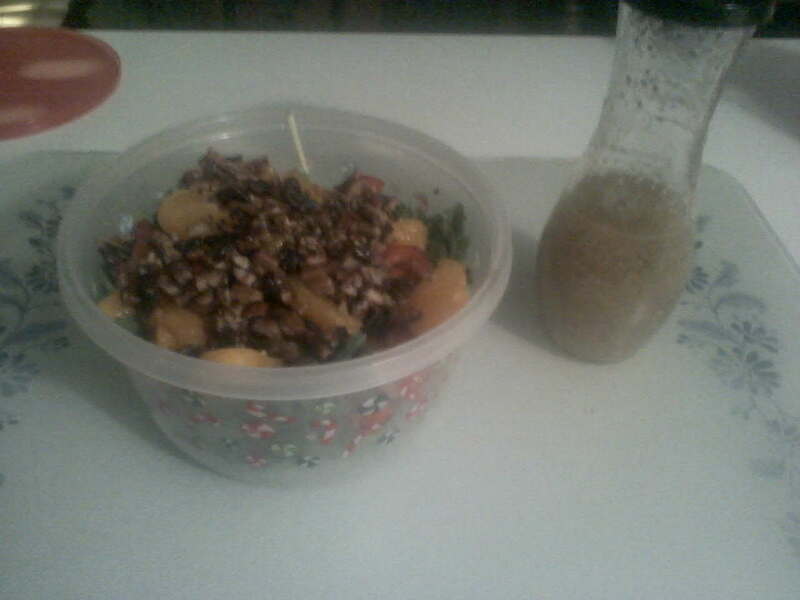 Oh well; this salad was still really good, and choc full of nutrients. Want another Fun Fact/Tip? Collared Greens, ounce for ounce, have more calcium in them than milk. So, if you get the chance, definitely check them out! They’re a little tough in a salad, which is why I only added a quarter of a cup and carefully sliced/shredded them, but they added a little more interesting texture, something between cabbage and lettuce, and it wasn’t bad in small quantities. So i must say i giggled to myself throughout this page. I can just picture you standing in nanas kitchen in the dark holding your phone over your salad and her asking “what are you doing with that phone, it isnt going to count the calories for you” HAHAHA i think i just giggled somemore.